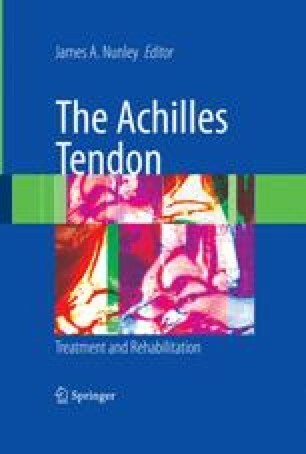 There is growing evidence that the clinical and operative use of ultrasound imaging can benefit patients with Achilles tendon pathology. Although ultrasonography has been stigmatized as too operator dependent and necessitating a steep learning curve, it has been our experience that the modality is relatively straightforward. Surgeons are in a unique position to utilize this technology, as they have the firm grasp of anatomy that is essential to the interpretation of sonograms. Ultrasound provides real-time dynamic imaging in the office and in the operative setting that directly benefits our patients. Ultrasound images can assist the clinician in determining the exact pathologic process, including location of symptoms, assessment of concurrent pathology, response to treatment, and the planning and intraoperative assessment of tendinous pathology. RadiologyInfo. Radiological Society of North America, Inc. (RSNA), 2007 http://www.radiologyinfo.org/en/info.cfm?pg=musculous8bhcp=1.